On 17-18 April 2018, the Combined Maritime Forces (CMF) co-chaired the 42ndShared Awareness and De-confliction (SHADE) conference in Bahrain alongside EU NAVFOR. 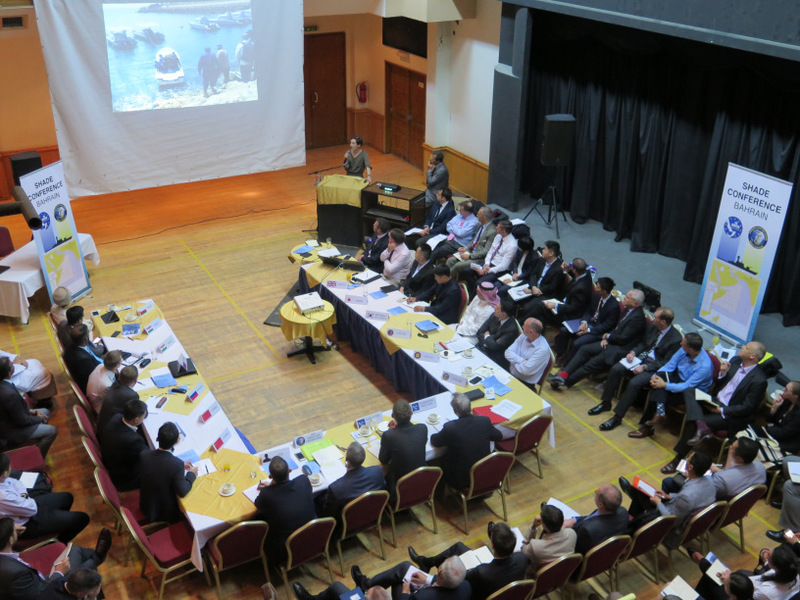 Over 110 people attended the conference including representatives from maritime shipping partners alongside the independent maritime naval force representatives from Russia, China and India. 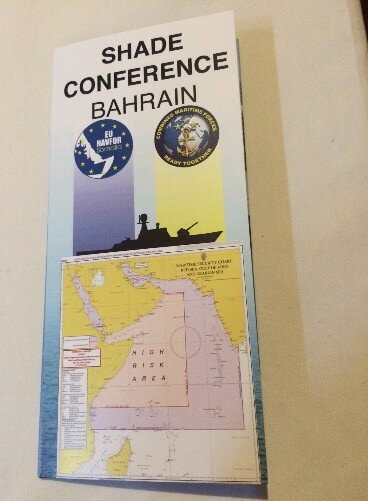 The SHADE conference occurs twice yearly in the Kingdom of Bahrain with chair responsibilities rotating between CMF and EU NAVFOR. The main purpose of the conference is to offer delegates the chance to discuss and understand issues surrounding maritime security in the region and to ensure de-confliction between navies when conducting operations. A diversification of threats in recent years including piracy, terrorism and narcotic smuggling has seen a need for all maritime agencies to work more closely to ensure freedom of navigation. CMF’s counter piracy mission will remain in the future but it will aim to have closer coordination, cooperation and collaboration to support EU NAVFOR and partners across the diverse range of maritime threats. This will assist EU NAVFOR and independent deployers to deliver effect within their respective mandates so that together they can use all available means to ‘find, fix and finish’ against a range of threats to the free flow of commerce. With organisations working in this complementary way, sharing information will act as a force multiplier in these endeavours. Keynote speakers included retired Indian Navy Vice Admiral Pradeep Chauhan who discussed his views on the geo-political regional situation and focusing on Somalia, he commented “Security is more than just maritime security and the maritime is more than just the navy and the coast-guard. There is a need to rebuild the Somali maritime and fishing capability in order to ensure regional stability” he importantly added: “to do this we must avoid failures of imagination, looking to develop a comprehensive approach to solutions.” A delegation from EUCAP reinforced the need to grow the maritime capabilities in Somalia and outlined some of the EU efforts that are partnered with international organisations. The United Nations Somali and Eritrea Monitoring Group (SEMG) were represented by Dr Charles Cater and Jay Bahadur who discussed the need to interdict charcoal, narcotics and arms smuggling, which support piracy and terrorism. Interdiction of these illegal assets relies on effective information sharing amongst all partners. They outlined a recent example of weapons smuggling interception which was ‘found, fixed and finished’. A CMF Maritime Patrol Aircraft identified the consignment moving from Yemen to the Puntland Coastline; the information was shared via EU NAVFOR’s Maritime Security Centre Horn of Africa (MSCHOA) and passed to Somali officials and regional maritime law enforcement entities (fixed) who were then able to conduct arrests as the smugglers came ashore, with the SEMG then able to inspect the seized weapons (finished). This excellent example demonstrates the cooperation, coordination and collaboration concepts now being used in action across the organisations in the region. As the 42nd SHADE closed the maritime community was charged with continuing its on-going and combined efforts to remain vigilant, to apply Best Management Practices, to continue with information sharing and collaboration to ensure maritime security. CMF and EUNAVFOR will remain firm partners in these efforts. The 43rd SHADE is planned for the end of 2018.